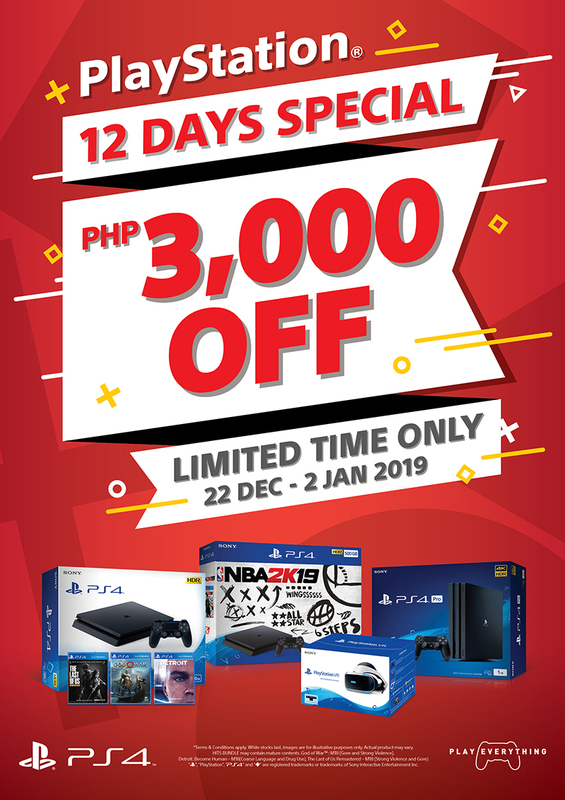 Sony Interactive Entertainment Hong Kong Limited Singapore Branch (SIES) announces “12 Days Special” campaign which offers discounts and promos on PlayStation®4 (PS4™) consoles and PlayStation®VR (PS VR) with PlayStation®Camera for a limited this holiday season from December 22, 2018 to January 2, 2019. Play as your favorite NBA teams and experience real-life basketball excitement with the PS4 NBA2K19 Bundle. This bundle includes the Jet Black 500GB PS4 console, a DUALSHOCK®4 wireless controller, a Blue-Ray Disc™ of the game, and a PS4 One-Year Extended warranty service. Another bundle includes Rockstar’s highly anticipated Red Dead Redemption 2 which will leave you in awe as you experience living an outlaw’s life. This bundle will give you access to the game’s improved graphics and performance. The PlayStation 4 (500 GB), includes The Last of Us Remastered, God of War and Detroit: Become Human, while the PlayStation 4 Pro (1 TB), includes additional free DUALSHOCK®4 Wireless Controller. The PlayStation 4 Pro is the most powerful Playstation ever made. The PS4 Pro experience offers powerful performance along with stunning 4K and the latest blockbuster games. Nothing can beat the classics, in this case, the PlayStation Classic. Feel nostalgic playing over 20 classic game titles such as Tekken 3, Grand Theft Auto and Final Fantasy VII. Immerse yourself in the virtual world of gaming with the PlayStation VR. Enjoy VR games like ASTROBOT: Rescue Mission and Tetris Effect on the PS VR’s 5.7-inch OLED screen, 3D audio and the PS VR headset. To learn more about Sony’s 12 Days Special, visit https://asia.playstation.com/en-ph/campaign/whats-your-play/promotions.